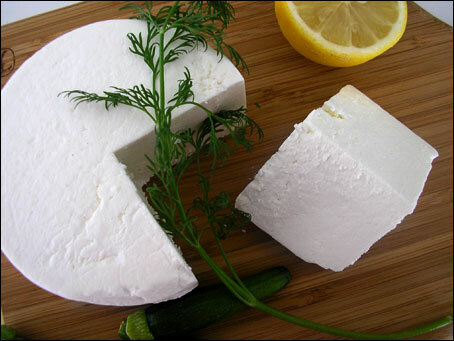 Manouri is a semi-soft fresh white cheese made from the drained whey from feta production (sheep or goat milk). 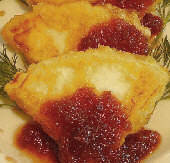 It is similar to feta cheese but creamier and less salty or salt-free. It is made in Central and Western Macedonia and in Thessalia. Manouri has a slightly grainy creamy texture and a milky taste with a mild citrus flavor. Like feta, it does not have an outer rind or solidified casing. It is almost always sold in log-shaped rolls, or in individual pieces cut from a roll. Manouri is a popular cheese used in salads, pastries, as a dessert cheese, and in other dishes. Wherever a sweet, rich cheese is used, consider manouri. It has a fat content ranging from 36 to 38%, and a low sodium content of 0.8%. goat cheese, cream cheese, or farmer’s cheese.